What is the importance of the number 2.4 in IoT? Come find out- A Workshop for all your curiosity about IoT! IoT generates a lot of data and to understand data you need data analytics. Not all data is “good” and a combination of IoT and Analytics is the answer to companies looking to decide which data should be stored and which should be thrown away. With this power, IoT is set to create millions of jobs in a global new economy which is expected to grow to more than $2 trillion by 2025. Keeping this “Million dollar opportunity” (literally!) 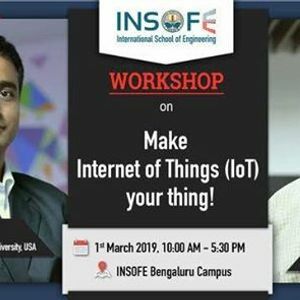 in mind and helping professionals to be part of this revolution, INSOFE is launching its own IoT program. As a first step towards this educational journey. 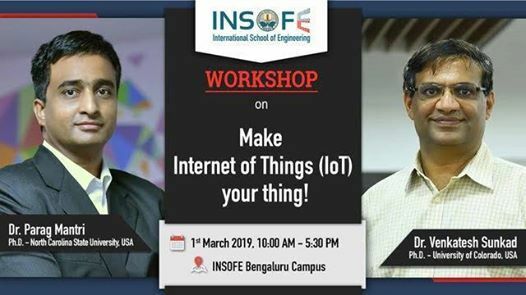 This Workshop is meant both for business leaders who would like to understand the technology of IoT to build CoEs in their organizations and also for fresh to mid-level engineers to get a taste of working Hands-on in IoT space.